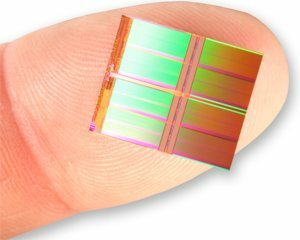 SanDisk has announced the world’s smallest 128Gb (16GB) NAND flash memory chip built using a 19nm process, knocking another nanometer off of the world’s current smallest flash memory chip, Micron’s impressive 20nm 128Gb version that was announced in December. Toshiba teamed up with SanDisk to develop the new memory chip, in a joint effort led by Yan Li, director of memory design at SanDisk’s Milpitas campus. It can store up to 128 billion bits of information on its silicon die that measures just 170mm² and uses SanDisk’s multi-level cell (MLC) NAND chips combined with their own three-bit per cell X3 technology, which allows for read/write of three bits of information in each memory cell. "At 19-nm, SanDisk is deploying its ninth generation of multi-level cell (MLC) NAND products and fifth generation of X3 technology," the company said in their press release. "This combination of manufacturing and technical expertise helps SanDisk pack more information into each memory cell making it possible to create a smaller, denser NAND flash memory chip." The 3X technology gives the new memory chip an industry leading 18MB/s write performance when combined with the company’s All-Bit-Lane (ABL) architecture, which allows for reliable simultaneous access to two word lines. "Building a 128Gb NAND flash memory chip with this level of complexity is an incredible achievement," said Mehrdad Mofidi, vice president, Memory Design. "This innovation allows SanDisk to continue to be a leader in helping our customers deliver smaller, more powerful products capable of doing more at lower cost." A single 128GB memory module would consist of eight 128Gb (16GB) NAND chips, making it tiny, fast and power efficient for its size and capacity. Micron is already mass producing 128Gb versions on the 20nm process, so the increased competition should help drive prices down as the new memory chips make their way into the latest next generation tech gadgets such as tablets, smartphones and solid state drives. Also announced is a 19nm 64Gb (8GB) NAND flash memory chip that is compatible with the MicroSD format. SanDisk has begun shipping both chips, with production expected to ramp up to full capacity and mass production very shortly.